Hillary Chybinski: do your pajamas have a cape? do your pajamas have a cape? check out these new Pjs (from Target - where else??). 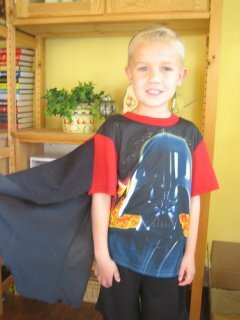 i have to say, the velcro-attached cape really make them special. and of course the shorts were WAY too big in the waist, so mommy got out her handy sewing box (WHAT????!!!!) and tightened them up. . .i think ryan was amazed that i could do this. . .
he wasn't the only one - DOI!